IN Bargarh district of western Orissa, Lingaraj is known for organizing farmers against an increasing diversion of the Hirakud water to industry. In 2007 and 2008 he played a key role in demonstrations at the reservoir in Sambalpur, which forced chief minister Naveen Patnaik to announce that industrial units will not be provided water from it at the cost of irrigation. But he does not take Patnaik at his word. Lingaraj has thrown his hat in the election ring by contesting the Bargarh assembly seat. 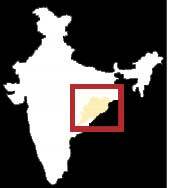 "Hirakud is a priority and the election is an opportunity to bring it into public focus," said the 48-year-old. About 300,000 farmers depend on the Hirakud dam for irrigation. While the ruling Biju Janata Dal (bjd) has not taken a stand on diversion of water, the bjp and the Congress are supporting the farmers. WE have been fishing in the coastal waters since generations but the government has now imposed restrictions in the Gahirmatha marine sanctuary and in the Devi and Rishikulya river mouths in the name of turtle conservation. How can we survive?" asked Narayan Haldar, the president of the Orissa Traditional Fishworkers' Union. Haldar said the fishing community in Kendrapara would vote for only those who are sympathetic to its cause. "We are also asking parties to incorporate in their manifestoes our demand for withdrawal of the 2008 Coastal Management Zone notification which threatens to shrink space for the community on the coast by allowing industries there," said K Aleya, the general secretary of the union. 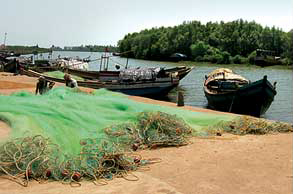 No party has included the fishers' demands in its manifesto. State bjp president Suresh Pujari said the demands will be considered sympathetically if the party won. bjd general secretary Narendra Swain said the government was already trying to strike a balance between conservation and fishing. IN the southern district of Malkangiri people threatened by the Indira Sagar Multi-purpose Project dam on the Godavari want parties to stop the project. The dam in Andhra Pradesh will inundate 28 villages in Mottu and Pasuguda panchayats of Malkangiri. "The Orissa government has filed a case in the Supreme Court but we want it to take up the matter at the political level as well," said Ramesh Majumdar, the convenor of people's group Malkangiri Visthapit Jan Suraksha Manch. A Rabi Kumar, a Manch activist in Mottu, said people can go to the extent of boycotting polls. "It's a question of life and death for us. We are holding meetings to build public opinion against the dam," Kumar added. The bjp and the bjd said they would fight the project. Dongria Kondhs of Kalahandi district, close to Bargarh, are determined to prevent bauxite mining in the Niyamgiri hills they revere. "Our vote will go to those who promise to save Niyamgiri with sincerity," said Sishir Pujari of Green Kalahandi, the organization spearheading the agitation against the mining company, Vedanta Alumina. Former member of Parliament and Congress leader Bhakta Charan Das, who has been in the thick of the agitation, said, "I and my party remain committed to saving Niyamgiri." The bjp's stand is the ecology of Niyamgiri and tribals' means of living must be protected. bjd's Swain, however, said, "Our party is for industrialization, though we have maintained it should be done with minimum damage to the environment." In Jagatsinghpur in the east, posco Pratirodh Sangram Samiti is motivating people to pressure parties to scrap posco's steel plant near Paradeep. The Samiti says the project will destroy the region's betel- and coconut-based economy. "The people must ensure that driving posco out becomes the top political agenda," said Samiti secretary S Mohapatra. On the cpi -- whose leader Abhay Sahu was spearheading the agitation until his arrest -- making an electoral pact with pro-project bjd, Mohapatra said, "Abhay Babu was leading us not in his capacity as a cpi leader but as someone who felt our cause is just."